EWI has developed units and processes that effectively sterilize toxic and possibly infectious waste materials from hospitals and clinics. The MD series of processing units, with the MD-1000 as a flagship, are very effective medical waste sterilization units. They use the patented Reverse Polymerization approach to achieve sterilization, with a greater then 6log10 reduction of viable spores. EWS has worked with key third-party suppliers to incorporate their products into the MD system to handle process control, nitrogen production, environmental control, material handling and power generation. Medical waste enters the first chamber where a nitrogen purge is applied. The load is then weighed and the data is analyzed by the process control software. The waste is moved to the second chamber where microwave energy is applied directly to the load. 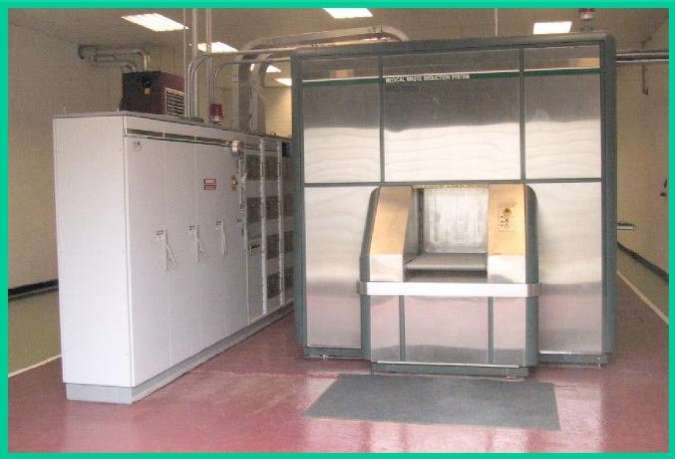 In this chamber, the waste is reduced by Reverse Polymerization to a sterilized carbon residue. The final chamber allows the residue to cool prior to grinding. The sterilized carbon residue is removed from the third chamber by a pneumatic system and deposited in a holding container for disposal with other domestic or municipal waste. Learn more about our medical waste breakdown and sterilization process. The MD-1000 unit can be modified to process and reduce animal waste into its constituents. This waste ranges from natural refuse to biohazardous effluent materials produced during animal research. Called the AW-1000, this modified unit has many of the same specifications and follows the same process that the MD units do. Using the RP process, the AW-1000 quickly and efficiently carbonizes entire animal carcasses, achieving a mass and volume reduction of about 80% with a 6 log10 sterilization efficacy.